The Oakland Raiders are gone for Las Vegas. But, wait, they’re still in town for another 2-3 years? So you’re saying there’s a chance? Probably not, but with the Warriors’ new arena in San Francisco beginning to rise, the focus toward the last half of 2017 was on the Athletics, the only franchise saying it wanted to stay in Oakland. However, despite the team making good on its pledge to announce a preferred location for a new 35,000-seat ballpark, the choice of the Peralta site near Laney College was panned by officials and critics as too difficult to navigate Oakland and the state’s regulatory maze. 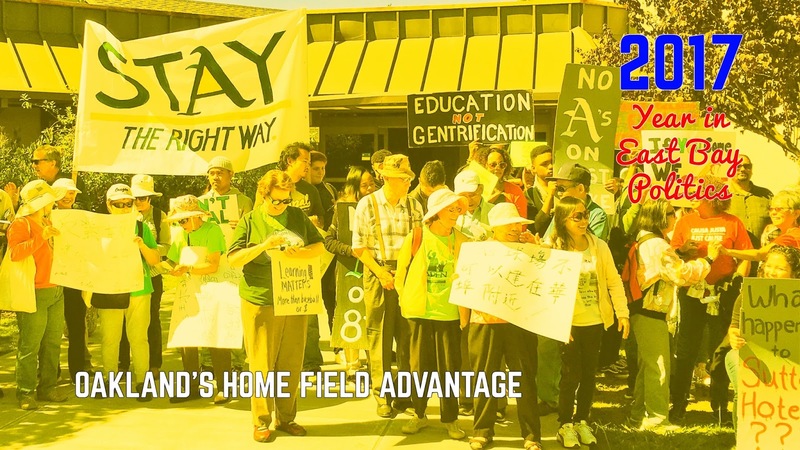 They may have ultimately been right, but in the short-term, it was a raggedy, but well-organized group of students and housing advocates who made the A’s brain trust look like A-ball amateurs. But the year started, in a sense, as the beginning of the end for a new football stadium in Oakland. By late November, it was clear that Oakland and Alameda County officials were ready to learn from their mistakes and begin consolidating ownership of the Coliseum under the umbrella of the city. ●For the second time in as many years, the Raiders file relocation paperwork with the NFL to move the franchise from Oakland, this time, to a publicly-financed stadium in Las Vegas. >>>> TOP 10 STORY On the eve of the Raiders announcing their move to Las Vegas, Mayor Libby Schaaf tries one last time to make a case for the team staying in Oakland, but the deal is done. The team, though, is still slated to play at the Coliseum for at least another two seasons, maybe more. 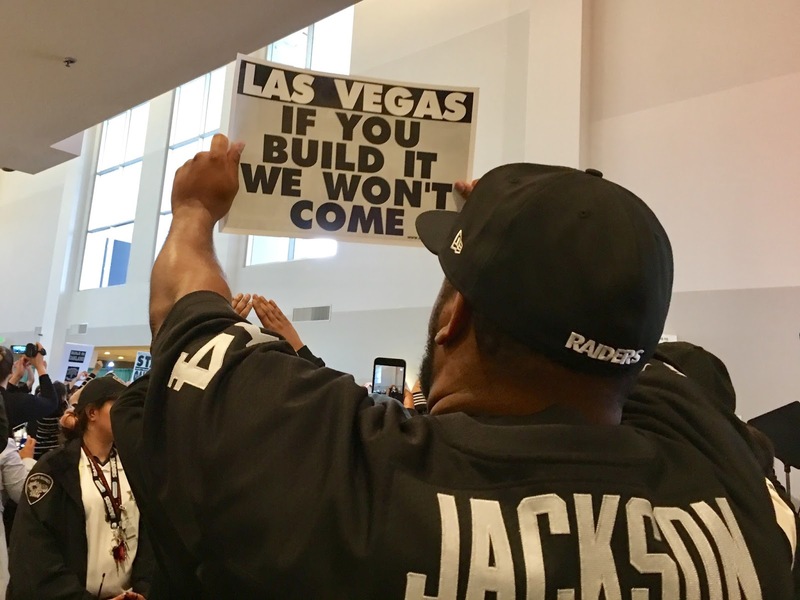 ●A local group of Raiders fans enlist anti-trust attorney’s to study whether the team and National Football League can be sued for violating its own bylaws following the team’s planned move to Las Vegas. Some Oakland and Alameda County officials show support, but the group is cagey about who will pay for the legal representation. ●After teasing A’s fans all summer that an announcement is imminent about a new ballpark in Oakland, they reveal on Sept. 12 that they intend to build near Laney College. ●Coliseum JPA Executive Director Scott McKibben is believed to be heading to Santa Clara to take a similar position at Levi’s Stadium. But a generous last minute offer–$300,000 a year–brings him back to the JPA. ●NBA champs or chumps? 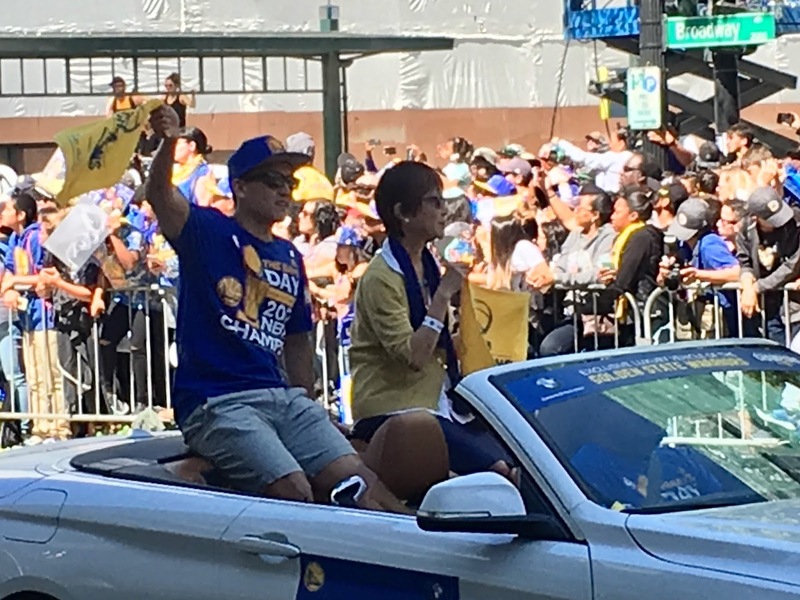 Warriors management continues to dispute paying its portion of roughly $40 million in arena reconstruction debt. The Coliseum JPA will enter mediation with the team. Later, it will do the same with the Raiders over disputed parking fees. >>>>Activists begin turning up the heat on the A’s and politicians with a series of rallies in opposition to the Peralta ballpark proposal. Their push back, however, isn’t totally negative and tinged with love for the team. ●”The city is not going to put up no public money,” says Oakland Councilmember Larry Reid in a comment that leads the Coliseum JPA to vote against joining a fan-backed strategy to sue the Raiders and NFL. Oakland’s city attorneys office identified significantly liability to the city and labeled the lawsuits chances for success at 50-50. 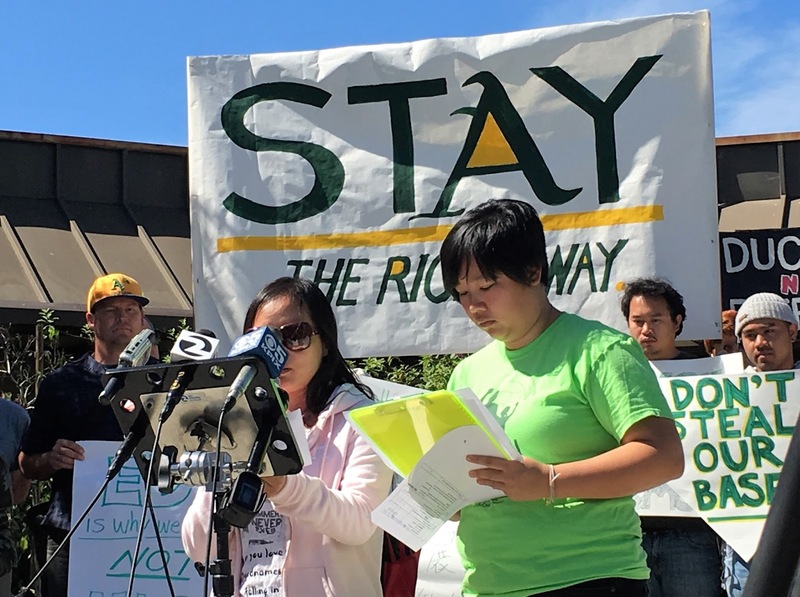 ●In a turn of events that shocks nearly everyone, the proposed A’s ballpark near Laney College strikes out badly following a direction by the Peralta Community College Board of Trustees–which owns the land–to immediately cease talks for a sale. The A’s are blindsided and previous and repeated talk of no “Plan B” worries fans and public officials alike. ●Alameda County and Oakland officials appears to realize the three-headed regulatory body that also includes the Coliseum Joint Powers Authority is not the way to develop the stadium property. County officials approve a resolution to move forward on likely robust talks for them to sell their interest in the property to the City of Oakland. Posted in 2017 Year in East Bay Politics, Athletics, coliseum, Coliseum JPA, debt, Larry Reid, Las Vegas, Oracle Arena, Peralta ballpark, Peralta Board of Trustees, Raiders, Warriors. Bookmark the permalink.